1-800-SWEEPER About Us Why Choose Us? 1-800-SWEEPER is a nationwide service network of independently owned power sweeping companies. Our reliable, value oriented sweeping services serve a diverse customer base including national and regional facility management companies, regional home builders, municipalities, state highway departments and local area contractors. The 1-800-SWEEPER organization has brought sweeping companies from coast to coast under a unified marketing and service structure. Partners each operate their business under their own name, but we all have the same mission - providing our valued customers with quality, reliable power sweeping services that exceed expectations. This structure gives customers piece of mind and the knowledge that our entire organization strives to meet ethical and educational standards unparalleled in the power sweeping industry. Our goal is to be your complete power sweeper service solution. Partners located throughout the United States can handle power sweeping jobs of all sizes, from local, one-time immediate service projects to ongoing contracts requiring coverage at multiple locations throughout the country. From sweeping roads and construction sites to shopping mall parking lots and warehouses, our partner companies have the correct equipment to meet all your sweeping needs. The environmental experts at 1-800-SWEEPER have the personnel and systems in place to see that your parking lot sweeping or street sweeping job is done right, 24/7, 365 days a year. For managers of businesses requiring nationwide or regional service contracts, our service network can provide reliable, uniform sweeping of your facilities. Best of all, with single source responsibility, billing and administration of your account can be handled from our headquarters office keeping your vendor list shorter. Our opportunities to share best practices for running a sweeping company to ongoing education in environmental regulations and responsible waste handling keep as at the forefront of the industry. From our annual Sweeper Summit, to regional in-person maintenance training opportunities at equipment manufacturers to in-shop staff training events to our state-of-the-art Sweeper Sim sweeper operator training simulator, the partners at 1-800-SWEEPER have proven through the years that we want the best-educated workforce and management in the power sweeping industry. Each 1-800-SWEEPER partner belongs to the North American Power Sweeping Association. NAPSA is a national nonprofit trade association committed to promoting and educating the power sweeping community while enhancing the environment. Several 1-800-SWEEPER partner company executives are current or former NAPSA board members. Our co-op's combined purchasing power creates competitive pricing on vital equipment parts, supplies, sweeping vehicles, maintenance tools, continuing education, safety systems and fuel for the 1-800-SWEEPER partners in each of their respective local markets. Additionally, 1-800-SWEEPER enables growth opportunities for our valued and strategic vendor partners. By purchasing in bulk, we also extend savings and efficiencies to our end customers - truly a win-win-win. 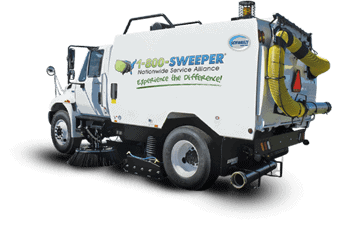 1-800-SWEEPER partners each operate their business independently under their own name, but we all have the same mission - providing our valued customers with quality, reliable power sweeping services that exceed expectations. We continue to enable growth opportunities for our valued, strategic vendor partners. Our co-op's combined purchasing power creates competitive pricing on parts, supplies, equipment, and fuel for the 1-800-SWEEPER partners in each of their respective local markets. Interested in learning more about the Premier Alliance of Power Sweeping Service providers? Click to find the best sweeping service near you to request a consultation today! Visit our partner page if you are a sweeping service contractor interesting in joining the 1-800-SWEEPER partners.